As a general rule, growth is hindered significantly when this temperature is lower than ~20OC (68OF) or above ~35OC (95OF). Although temperatures ranging from 30-35OC (86-95OF) produce optimum growth in some species, fungal diseases generally become more common. Inadequate dissolved oxygen levels are also a potential threat, particularly if the nutrient is not well aerated. Given that the optimum air temperature is also 20-25OC (68-77OF), the temperature of both the nutrient and root zone can be optimized simply by controlling the air temperature to within that range. This is especially the case if the root zone occupies a large surface area and is poorly insulated, such as in NFT channels. These features of NFT complicate attempting to set the two temperatures widely different from each other. 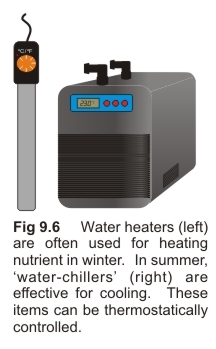 If additional heating of the nutrient solution is required, submersible water heaters are commonly used (Fig 9.6). Where cooling is needed, water-chillers are effective. For smaller reservoirs, some growers even utilize frozen water bottles. Positioning the nutrient reservoir in a significantly different temperature zone outside of the growing environment may help alleviate the need, or cost, of providing additional heating/cooling in some situations. In extreme climates, extra insulation can be gained by burying reservoirs underground.